In a previous post, I mentioned that I went to the Japan Rally in September of 2010. It was a great trip and I had a chance to visit a few new places in and around Sapporo. Sapporo is one of my favourite cities in Japan. In Sapporo, each season is extremely different. In the winter, you have the snow festival where you can see huge snow sculptures along the main park, Odori Park, and ice sculptures in Susukino. When you visit in the summer, Odori Park becomes one large beer garden where you can sit outside and enjoy several beers on a nice hot summer’s day. You can also head out to Furano as a day trip and enjoy the beautiful fields of lavender. On this trip, I obviously focused more on the Rally itself, but thankfully, there were a few things I wanted to try that I didn’t have a chance to do before. The only new place that I visited was the Hitsujigaoka. Literally translated into “hill of sheep”, it’s a nice little getaway that is located next to Sapporo Dome. To access the site, you have to take the Toho subway line to the final stop (Fukuzumi), followed by a short bus ride. You also have to pay the entrance fee to access the main park area. Walking is possible, but it’s very far from the station itself and not recommended. The public access area is located at the top of the hill and there is only a small area for people to roam freely. Unfortunately, when I visited, there were no sheep. This could be due to the foot and mouth disease that afflicted the southern island of Kyushu earlier in the year, so they decided to protect the sheep from infection. It could also be due to the season, but I’m not entirely sure as to why. At the hill itself, there are only a few buildings of interest, and it only takes a few minutes to enjoy them. One of the more spectacular buildings is the Hitsujigaoka Wedding Palace. It’s a tall building that’s pure white inside and out and many weddings are held there. If you are thinking that you’ll see a traditional Japanese wedding, you’ll be disappointed as the weddings here are almost always done in a western style. I didn’t get a chance to go inside, but I did see a wedding and did get a chance to see the building itself. Another building that is of interest is the Austrian House. It’s an Austrian styled building that houses a souvenir shop and a small snack shop. Inside, you can also get your palm read among other touristy things. The last main building is the Sapporo Snow Festival Museum. It’s a small building where they feature posters, photos, and miniature models of past snow sculptures. There are also videos on how they run the snow festival every year. Unfortunately, the video is in Japanese, and on a very old TV. The main claim to fame for Hitsujigaoka is the statue of William S. Clark. William S. Clark was an American Professor who moved to Japan for 8 months in 1886-1887. His main goal was to set up and establish the Sapporo Agricultural College, now Hokkaido University. He had a huge influence on Hokkaido and helped with its colonization. His influence on this island was tremendous and he’s famous throughout Japan. He even helped introduce Christianity to this area of Japan by creating an ethics class that utilized the Bible when the Bible was outlawed. When he left Japan, he gave three parting words to the first class of Hokkaido University, “Boys, be ambitious”! There are several variations added on this, but these three main words are what stuck. Throughout Japan, many schools use this motto to help motivate their students, and it’s hard to find anyone who wouldn’t know what you meant if you said “boys be ambitious”. 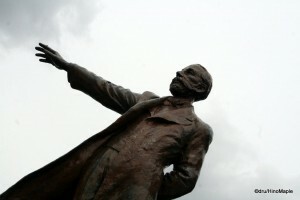 At Hitsujigaoka, the statue of William S. Clark is prominently displayed with him pointing to the distance, probably to Hokkaido University, and the famous motto written under him. It’s common for people to run up and just point in the same direction as William S. Clark’s statue for fun. If you walk around a little more, you’ll also see another small monument that is dedicated to the Nippon Ham Fighters. I believe it commemorates the move of the Nippon Ham Fighters from Tokyo to Hokkaido in 2004. It’s a small, often overlooked monument that is probably not interesting to most foreign tourists. Back at Fukuzumi Station, there is a short walk to reach Sapporo Dome. 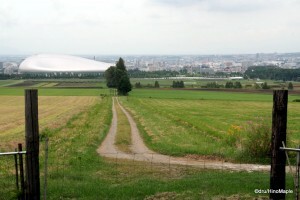 Sapporo Dome is a very interesting area. While you may not need to go to watch a game, you can definitely go and enjoy the park behind the dome. As you approach the dome from the station, you’ll see a very futuristic looking building. 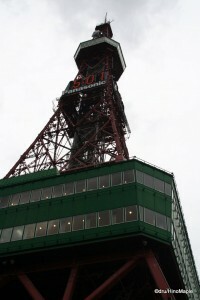 There is a large observation platform that is easily viewable from the street. You can enjoy a tour of the dome itself with a chance to actually walk on the baseball field, but I’m not too sure if that is possible. Of course, both of these tours are paid services. If you don’t want to spend money, walking past the front and approaching the park in the back is great. It’s an amazing sight to see the football pitch sitting outside with the potential for it to be brought in for football games. You can watch videos of this happening on their own website. 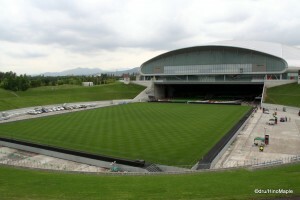 Even if you aren’t too interested in the football pitch, or the technology, the entire park has several modern art sculptures. I couldn’t grasp the meaning of each sculpture, but it was a nice place to spend an hour or so. You could also just lie on the grass and enjoy the nice weather, if you are lucky. I may or may not have mentioned this in the past, but the food in Hokkaido is amazing. If you enjoy eating, Hokkaido has everything you need to be stuffed. Going to the Sapporo Beer Garden, you can enjoy Ghengis Khan, a type of barbecue, or a seafood buffet. 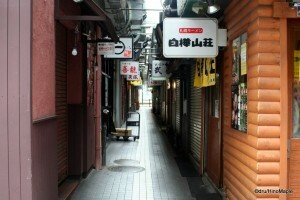 You can also head to Ramen Alley and get a nice bowl of corn butter, or seafood ramen. Delicious is an understatement. 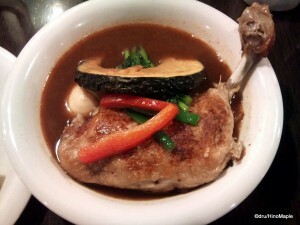 Recently, Soup Curry has become popular. There are several shops located throughout Sapporo and all of them are delicious. Keeping things traditional, you can still get seafood doburi all over the city, and being Hokkaido, chocolate, corn, and milk products are extremely popular. When visiting Hokkaido, it’s a must to eat as much as you can. Unfortunately, there isn’t much more for me to see in Sapporo, so I may not return for some time. I have been there almost every year for the last 3 years and each time has been different. The weather and season plays a huge part in how things look and feel. The people are all the same, very relaxed. When visiting Sapporo, it’s best to just enjoy things and take it slow. You’ll never know what you’ll discover just around the next corner. This is an update on what is happening in Sapporo. To read more about Sapporo, please continue to the original post on Sapporo. This entry was posted in Hokkaido and tagged Fukuzumi Station, Ghengis Khan, Histujigaoka, Hokkaido, Hokkaido University, japan, Japan Rally, Nippon Ham Fighters, Ramen Alley, Sapporo, Sapporo Beer Garden, Sapporo Dome, Sapporo TV Tower, William S Clark, 北海道, 北海道大学校, 日本, 札幌, 羊が丘 by Dru. Bookmark the permalink.